By the time you’re reading this, we bet that you’ve tossed enough yee sang for the year—congratulations, you now have sufficient prosperity to last you for the rest of 2019. A staple at every CNY Reunion dinner, we saw some pretty unique options like soft shell crab and fruit-based yee sangs this year. However, considering how we’ve still got a little over a week left of the Chinese New Year festivities, how about changing things up a little? 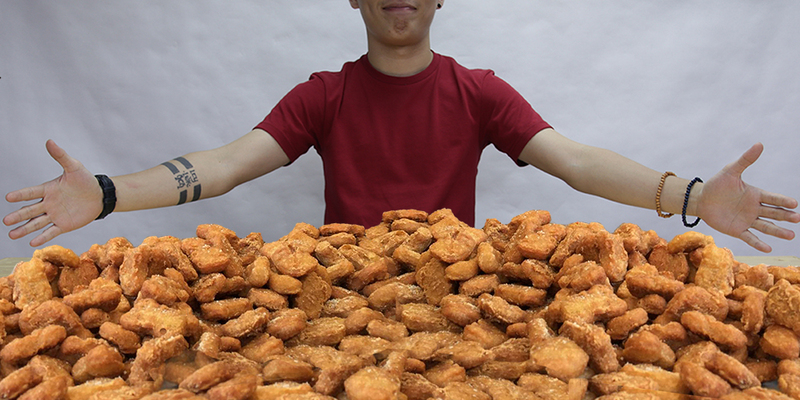 Why not host an epic nugget party and toss McDonald’s nuggets instead? So, if you’re planning on getting some McDonald’s food delivered to you over the festive break, be sure to order from GrabFood for some exclusive deals. Valid till February 17, all you have to do is spend a minimum amount of RM35 with the promo code KONGSIMCD to get 888 GrabRewards points + FREE delivery on your meal. Getting a minimum spend of RM35 is easy enough if you’re good at convincing your colleagues or family to indulge with you (psst, we did just that)! You can then use your 888 GrabReward points for discounts on your next GrabFood order, Grab rides, shopping vouchers, FREE juice, and much more. Best part is, you can stand a chance to win an epic McNugget Party! The top 10 GrabFood users with the most McDonald’s orders during the time period will win a McNugget Party consisting of 336 pieces of Chicken McNuggets! To put that into perspective, that’s almost a full year’s worth of McNuggets if you were to eat one every day this year. Talk about ending CNY with a bang! Besides McDonald’s, there are other great merchants available throughout Klang Valley like Village Park Restaurant, MyBurgerLab, MyPizzaLab, Tealive, KOI, Hameediyah and much more. Also, if you’re looking at ordering in some Yee Sang to continue tossing, you can order them from GrabFood too! To be eligible for the free delivery option on GrabFood, on purchases above RM35, use the KONGSIMCD promo code. The code is valid for the first 20,000 redemptions ONLY and free delivery is valid for 10 times per user. This article is written in collaboration with GrabFood.